Watch this video to learn about our Terrazzo Floor Restoration & Polishing Services. The good news is that terrazzo, when properly restored and maintained, is one of the best types of flooring to have in restaurants, stores, hotels, hospitals, schools, and bustling business environments. Stone Makeover provides expert terrazzo restoration and maintenance services so your terrazzo floors can continually look beautiful and new with minimal effort. Turn your buried terrazzo into buried treasure. With adhesives from carpet or tile, holes from carpet tacks or nails, ugly stains, unsightly cracks and chips, or other damage, old terrazzo may look like a hopeless cause. Before you cover that terrazzo again, let us get our hands on it. Stone Makeover's highly trained technicians can do amazing work with terrazzo. 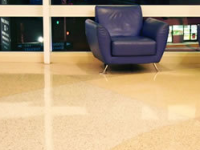 Watch our video to learn more about our terrazzo restoration services. For terrazzo floor polishing, terrazzo repair and restoration, or terrazzo floor maintenance services throughout the New York and New Jersey areas, contact us online or call (800) 661-7866 today!